But it took work to get there. I have very smart, talented and hardworking students. If their networking emails needed to be informed, edited and shaped, then I think everyone could benefit from the information that took their messages from okay but slightly problematic to very good. 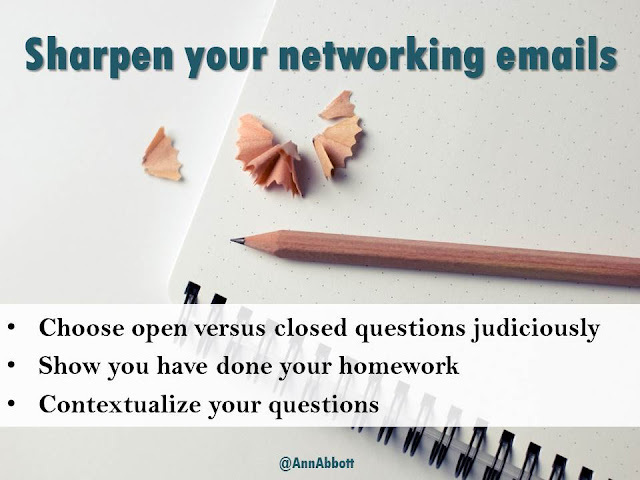 Here, in order, are the steps you can take to make sure your networking emails or direct messages are sharp, clear and compelling. Read advice about how to compose networking messages. Ask your mutual connection to pave the way. This is huge. I reached out to my former students before my current students sent them their messages. I'm Facebook friends with all of them, so I sent them a group private message to let them know that they would soon receive a message from my current students, that they had been selected by the students as people they wanted to contact, and that I knew that they are busy professionals who might or might not have the time to answer. Do you have a mutual contact, and could that person pave the way for your message? Write closed or open questions judiciously. On the one hand, closed questions (yes/no; today/tomorrow; the HR address/specific person; email/phone call/office visit; etc.) make it extremely easy for the person to reply to your message. That is a very good thing. A very good thing. People are very busy, and you are making their lives easier if they can quickly read your message, identify exactly what you want, and give it to you with a few keystrokes. Example: Could I send my resume to you, or do you prefer that I send it to someone else? On the other hand, if you are seeking advice and wisdom, then your questions should be more open. That lets the person you are reaching out to give you their very best insights, from the perspective they think is best. "How did your study abroad experience contribute to your professional success?" Show you have done your homework. But let's take that same question about study abroad and make it even better. After all, "How did your study abroad experience contribute to your professional success?" is a question you could ask to anyone who has studied abroad. You need to personalize the question. On the one hand, it is flattering to know that someone has taken the time to research you, your background and your accomplishments. But it's not about empty flattery. You need to do extensive research (as much as possible) on the person so that you can ask the most helpful questions--those that the person can answer well and that give you valuable feedback. Again, this sounds obvious. But my students had spent at least an hour, working in a team, researching these three alums on several different web platforms. They knew a lot about them. But when I read the first draft of their questions, that wasn't apparent. They had done the homework. It just didn't show. Make sure it shows! "I see that you studied abroad in Bilbao, Spain. I studied in Barcelona but took the train to País Vasco for a weekend and loved it. How did your study abroad experience contribute to your professional success?" As I read my students' drafts and second drafts, I tried to put myself in the place of the alum who would receive the message and questions. That's when it became clear that many of the questions need a context that would help the alum shape their response. In other words, why are you asking this question? What do you hope to get from the answer? "I see that you studied abroad in Bilbao, Spain. I studied in Barcelona but took the train to País Vasco for a weekend and loved it. Still, I'm struggling to know how to put this experience on my resume and talk about it interviews. How did your study abroad experience contribute to your professional success?" In the end, my students wrote wonderful messages and received fantastic feedback. Part of the success, I believe, was that we approached this as a project that multiple steps over multiple class periods. We workshopped it in class so that I could do a solid face-to-face editing before they mailed off their messages. So never underestimate the power of asking someone knowledgeable to look over your message before you send it. If your communique is well-done, you can receive some valuable networking experience, information and contacts in exchange. What are your thoughts? Have you had a good networking experience that worked similarly or differently? Do you teach others how to network well? Leave me a comment or send me an email at arabbott@illinois.edu. Love, love, love these tips. And the bullets at the top are perfect takeaways. You've hit on the exact subtleties that make all the difference between successful and unsuccessful correspondence! Sometimes context is just "say who you are and how we're connected"--the informality of email makes it too tempting to just jump right in.